IT virtualisation, the engine behind cloud computing, can have significant consequences on the data center physical infrastructure (DCPI). Higher power densities that often result can challenge the cooling capabilities of an existing system. 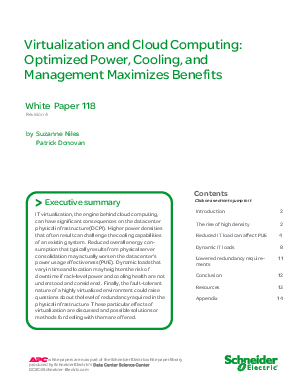 Reduced overall energy consumption that typically results from physical server consolidation may actually worsen the data center’s power usage effectiveness (PUE). This paper shows how virtualising a data center’s IT resources can have certain consequences related to the physical infrastructure. Download now to discover possible solutions or methods for dealing with the effects of virtualisation.